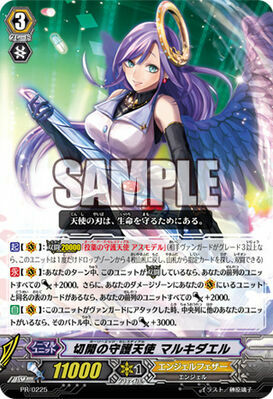 Le-Vanguard: Angel Feather Celestial Anime Matsuri Legion! It's Anime Matsuri again!! YAYYYY!!! On another note, several clans have gotten Legion during this event(see: "Legion: the basics"), and one of them is Angel Feather with their beautiful Celestials. Let's take a look at their Legion unit shall we? [CONT](VC): During your turn, if this unit is in Legion, all of your units in the front row get [Power]+2000. Then, if you have a face up card in your damage zone with the same name as a unit on your (VC), all of your units in the front row get [Power]+2000. [AUTO](VC): When this unit attacks a Vanguard, if there is another unit in the center column, this unit gets [Power]+3000 until end of that battle. [AUTO](RC): [Counter Blast (1) & put this unit into your damage zone]When this unit's attack hits a Vanguard, you may pay the cost. If you do, choose one face up card not named "Overdose Celestial, Asmodel" from your damage zone, and call it to (RC). I don't know about you guys, but these 2 just makes AF even more fun than it already is. Looking at the G2 Legion mate, it's an easy way to achieve the 2nd part of the skill for Malchedael. It can also combo with Emergency Celestial, Danielle when it enters the damage zone, allowing for more attacks in a single turn. Asmodel is basically a very pressurizing unit which would force your opponent to guard if they don't want more full-strength attacks coming their way(Raguel and Danielle, I'm looking at you :P). This is a basic field set-up i thought of which is very pressurizing to the opponent, because if they let Asmodel hit, it will open them up to 2 more full strength attacks from Raguel, and Danielle later. Of course, it's risky to be at 5 damage in the current meta, so the part about Danielle is optional, and you can have one less face-up damage. The reason I run Nociel in this build is to possibly swap Danielle or Asmodel into the damage zone, as well as obtain more shield for guarding during your opponent's turn. Hesediel serves as a good booster in the back row for higher powered columns. 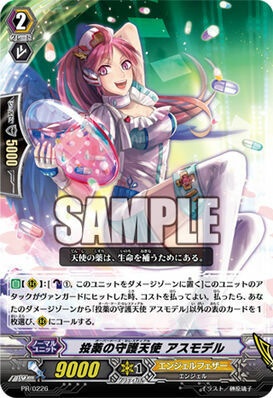 Narelle is a staple in practically every Celestial deck, because it has an on-call effect to allow you to swap cards from your hand with the damage zone, possibly setting up for more fun combos later. Penuel is still the best starter for the Celestials in my opinion because she allows you to superior call 1 unit straight from the damage zone for the effective cost of one counterblast(Asmodel & Raguel I'm looking at you :P).